The Demon Chernobog-Foiled but Not Defeated in The Shadow of the Lion-is Back to Conquer Venice. First Time in Paperback. Venice had been thrown into chaos by the scheming of Chernobog, who came within a hair of seizing absolute power, but was thwarted by the guardian Lion-spirit, who awoke to protect his city from the power-mad demon. But the power of the Lion does not extend beyond Venice, and Chernobog has a new ally in the King of Hungary, who has laid siege to the island of Corfu as the first step in his plan to seize control of the Adriatic from Venice. Trapped on the island is the small band of heroes who awoke the Lion and blocked Chernobog's power grab before. They are far from the Lion's power to help them, but as Manfred and Erik lead a guerrilla movement to fight the Hungarian invaders, Maria discovers that the ancient magical powers of the island are coming to life again, stirred by the siege. 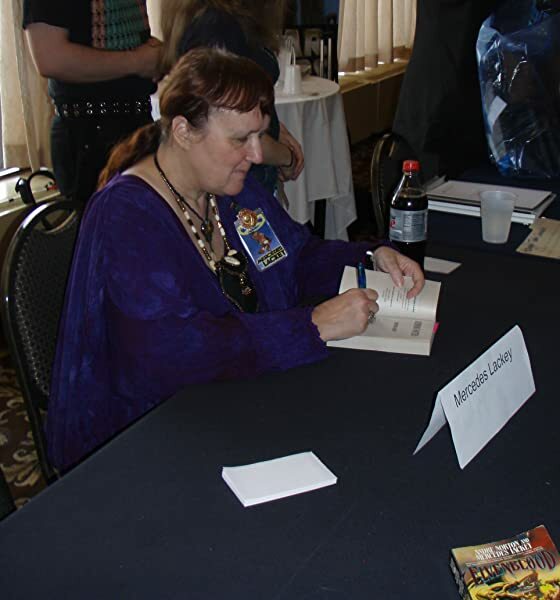 If she can make an alliance with them, she may be able to repel the invaders-but not without paying a bitter personal price. . . .
Mercedes Lackey is the author of the "Bardic Voices" series (Baen), the "Heralds of Valdemar" series (DAW), and many more. She even has her own fan club with over 1,000 members. Her books routinely rise to the top of the genre bestseller lists and become book club selections. 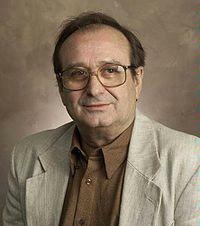 Eric Flint is a gifted new star of military SF. His major alternate-history novel, 1632, sold out its hardcover edition almost immediately. With David Drake he has collaborated on five novels in the popular "Belisarius" series. Dave Freer, author of The Forlorn (Baen) and of many articles in scientific journals, is an expert on sharks, an accomplished rock-climber, and was an unwilling conscript in the "undeclared" South African-Angolan war. 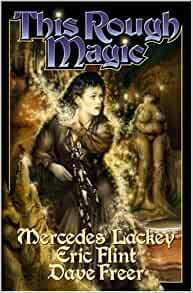 Start reading This Rough Magic (Heirs of Alexandria Book 2) on your Kindle in under a minute. As I said about the first book in the series, "Shadow of the Lion" all three of the authors excell at weaving, painting and crafting of worlds different from our own but familiar but breath-takingly believable. Others will give you book reports and synopsis. I tell you this book, and the others in the series, will take you to strange places that will hauntingly remind you of people and places you met in history classes, or perhaps English Lit, or geography or mythology. If you are very fortunate it will be like revisiting beloved dreams. I liked this book enough to buy it, and the rest of the series, twice. This way I have the original paperbacks and the new ebooks at my fingertips. 5.0 out of 5 starsWhy this is NOT a big fat fantasy...why you should read it! First, it really doesn't read like the sequel it is...it can be read standalone quite well. Second, it reads like a terrifically well realized alternate history, rather than another of the ubiquitous elves-dwarves-and-orcs fantasies we are inundated with. Third, it actually has some closure at the end, so it isn't like certain other fantasy series which are apparently never going to go anywhere, and never end either. Even the little, passing-through characters are very vividly realized, and are real people, not spearcarriers. Spiro, the Corfiote fisherman, for example, and his buddy, Taki the fisher captain, are human beings caught in the flash of the story's eye. I'm halfway through my third read of this book, and it is holding my attention so well that I have been sneaking off to read another couple of pages all day long. This is what alternate worlds fantasy should be. Kim Stanley Robinson, Harry Turtledove, and other practitioners, please take note. This is the reigning champion of the field. I really liked this book after I got into it but the first third was hard because I didn't read any of the others in the series and I didn't know the characters or their background. After I picked up on that it was very enjoyable. I only wish the series, Heirs of Alexandria, were numbered so I knew what books came before or after this one. 5.0 out of 5 stars"Rough but Sweet"
This is the following tale of "The Shadow of the Lion". It takes place in Corfu rather than Venice. Actually, it is an alternate reality in whichmagic persists and good and evil emesh the characters in a struggle for supremacy. The strength of this tale lise in the character development, especially of Maria and Benito. Most of the carryovers from the previous book are developed and humanized except Francesca, who seems a bit wooden and Marco and Katerina, who are reduced almost to caracatures. However it is in many ways a superior tale, and if you likked the first book, you will love this one. 5.0 out of 5 starsA good sequel. The second book in the Heirs of Alexandria series, set in 16th Italy in an alternate history where the library at Alexandria and arcane knowledge within it survived and magic is practiced by mages and clerics alike. I love this author and read everything I can that she has written. This book was a thoroughly enjoyable dark, old fashioned science fiction fantasy novel. I thought that the plot and characters were original and complex, and kept me glued to the book throughout the entire story.